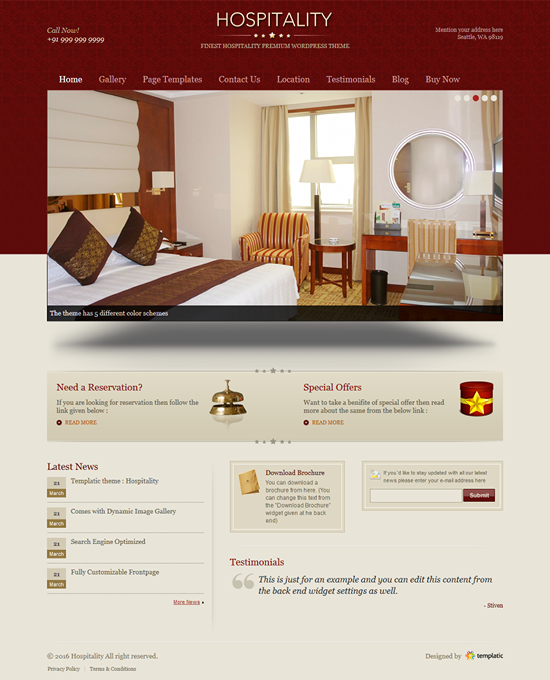 Let people know about your hospitality services by creating a website with the WordPress hospitality theme. The theme comes with a simple user interface and easy options to manage how your website works. To display your services more proficiently, you can use the dynamic image gallery. The hospitality theme is thoroughly customizable and comes with built in ad monetization features. WordPress websites are used by hospitals and clinics to connect with the patients who are looking for specific treatments and specialist doctors on the internet. WordPress is a popular website development platform and it is no wonder that hospitals and clinics have also started utilizing this platform for website development. [expand title=”Read More” tag=”a”] WordPress websites enable hospitals or clinics to own all the data available on their websites with no unauthorized person having any access to the content. Altering the content such as adding new treatment methodologies, new list of doctors, etc. can easily be accomplished without the need to touch the codes. We provide highly functional hospital website templates loaded with a number of unique features which are highly suited for medical professionals who want to create their own customized websites using an immensely popular platform. Anchor is our highly appealing wordpress theme for hospital which certainly cannot be ignored by medical professionals who want to create sophisticated websites for their establishments. We have provided a mega menu enabled navigation bar at the top of the website to display multi-level menus while the banner of the hospital or clinic features right at the top of the website. The big slider we have included can be used to display all kinds of services and best posts to the users. The visitors are also provided a swift window to subscribe and display social media accounts. Getting regular feedback from the visitors and your current patients also helps in improving your services. Positive feedbacks also act as promotional material for the visitors. Thus, we have incorporated bbPress in this theme. This tool helps in developing a community driven forum to get regular feedbacks. The WPML setup has also been included to enable the visitors set the default language in which they are comfortable. The design of the theme makes it integrate automatically with any kind of device. The Appointment Plugin enables many advanced booking features to be activated in your website. The booking form in this plugin has many in-built fields which are activated once the plugin is switched on. These fields can be easily customized which means that new fields can be added or the existing fields can be edited. The back-end of the plugin can be used to add different services to the form. You can also allot different services to different staff members along with different prices for the services. The back-end system also enables you to set times for which no bookings can be granted such as lunch time. The back-end availability calendar enables you to view the dates and time for which bookings are reserved. The Appointment Plugin also provides various payment gateways such as Pay Pal and PreBank Transfer. Appointment Plugin has been designed by us with the specific goal of making it function smoothly with any clinic website template and other wordpress themes.